Riding a three-game conference winning streak for the first time since 2008, TCU will play at No. 6 Baylor Saturday. The Horned Frogs are looking for their first win over an AP Top 25 team since a 70-55 win over No. 21 Oklahoma State on Feb. 14, 2015. 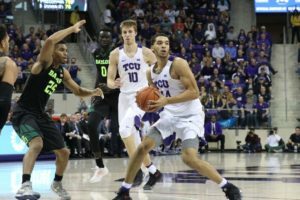 The Frogs have lost their last 19 games against ranked opponents, but a TCU win in Waco would be the highest ranked team the Frogs have taken down since a 62-55 win over No. 5 Kansas on Feb. 6, 2013. "Right now, we need to be the team that knows we lost a game we felt we should’ve won and we got an opportunity to play them again, which is the beauty of the Big 12," TCU head coach Jamie Dixon said. "Even if you lose early on, you know you can get them back again." TCU had an opportunity to knock off the Bears in Fort Worth on Jan. 21, but faltered, losing by nine. "We had a one-point lead with four minutes left and then they knocked down the three from there," Dixon said. "We knew it was right there and hopefully that prepared us to play the closer games that we’ve won down the stretch." Over the course of the Horned Frogs' three-game winning streak, forward JD Miller has been lights out from beyond the three-point line. He's 9-of-11 from 3-point range in the last three games, and the four 3-pointers Miller had in wins at Kansas State and against Texas Tech were career highs. The sophomore has made at least one 3-pointer in each of the last five games after not having any in the previous six contests. Miller has averaged 14.3 points and 4.8 rebounds in the last four games. Miller's head coach said the comfort level in shooting the basketball has risen throughout the entire team.